We recently had the pleasure of arranging a weekend visit at the Hope Care Center in Lehigh Acres for two sweet little boys, Timothy and Logan. 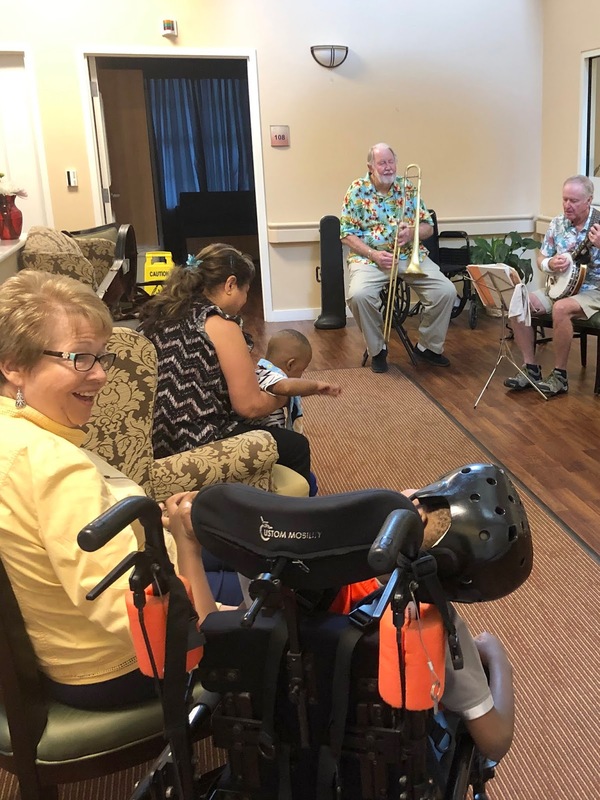 They both love music, so the Dixieland Band came by to give them a special performance. The brothers were delighted with the show, and Logan even danced to the music in his wheelchair. This weekend of respite was arranged to allow the boys’ mother to attend her college graduation in Tampa. Despite the challenges of caring for her special needs children, she was able to earn a degree in medical billing and coding. Darlean Johnson – 25 hours, including time early Friday morning to decorate their room! Thanks to this amazing team and all the Hope staff members who make this possible – as well as everyone who has donated to the Hope Kids Care program! Your gifts have allowed us to provide this important level of care, and we couldn’t do it without your support.